Tonight, a Goddess found me. For many years, I have acknowledged Anubis–Anpu–Yinepu–as the God of dead things, related to my art with the remains of animals. And he has watched over my work in the background, quietly, only occasionally coming forth to speak if he feels the need to add a bit of guidance. But still…so distant. Then the day came when the hide of a black coyote came into my possession. Even having lived and died a half a world away and thousands of years past the jackals of Egypt that gave their form to the God, this coyote carried that energy, inexplicably and completely. Familiar? How could I even know what to look for, when I knew not Whom I beheld? I knew scant little of her, as did anyone today–the feminine aspect–some said wife–of the better-known Anpu, had had little surviving lore and few adherents today. “Goddess of the 17th nome of Egypt, with the standard of the jackal” told me little. And so I returned to Her, perplexed. And before I could say a word, She saw my confusion, and She spoke. “I am the Goddess of funerary arts. When the stones were carved into the faces of pharaohs long-dead, My hand guided the chisel. When each set of canopic jars was formed, I shaped each detail and applied every stroke of the brush. And now, when you weave hide and bone into sacred art, My hands wrap around yours, and I see the work through your eyes”. The black coyote then wrapped around my shoulders, wishing that I would prepare her to move on to the next person in her afterlife, for, as for so many, I am only a threshold, a transitional point. And so we enmeshed ourselves, for three days and nights, in the sacred preparation and creation of what would carry a piece of each of us. And at the end of the three days and three nights, I wore a cloak upon my shoulders, with the sacred mantle and hood as the Goddess directed me and as the black coyote concurred and as I created. Khepri stretched his wings wide, and the name and standard of Anpu—Input—cascaded in hieroglyphs. This, then, was our inauguration, the Goddess and I. The black coyote would go forth as Her emissary while I would remain here and continue the sacred work as I always had, only with the consciousness of She who guided me. This headdress is dedicated to Anput, the female counterpart to Anubis. It is in no way meant to be an authentic replication of any traditional Egyptian creations, but is instead a hybrid of my own style mixed with elements inspired by a very general Egyptian aesthetic, guided by sacred inspiration (and many pictures of old statues and paintings from various dynasties!). 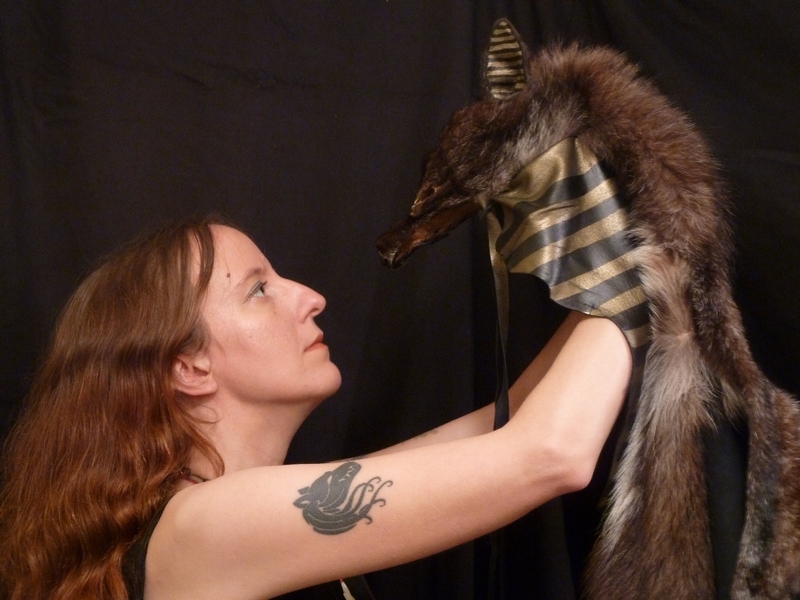 This headdress is based around a black (melanistic) coyote hide; this is a rare, but naturally occurring mutation in this species. This particular hide came from a small female, black with a white blaze on her chest. She is complete with all four paws and claws; the only piece missing is her lower jaw, which was removed for the purpose of this project. Her ears and face have been reshaped to a more natural appearance; they were originally rather flat and misshapen, as many hides are after tanning. Her face has been given painted details, to include hold around the eyes, and gold accents on her nose. 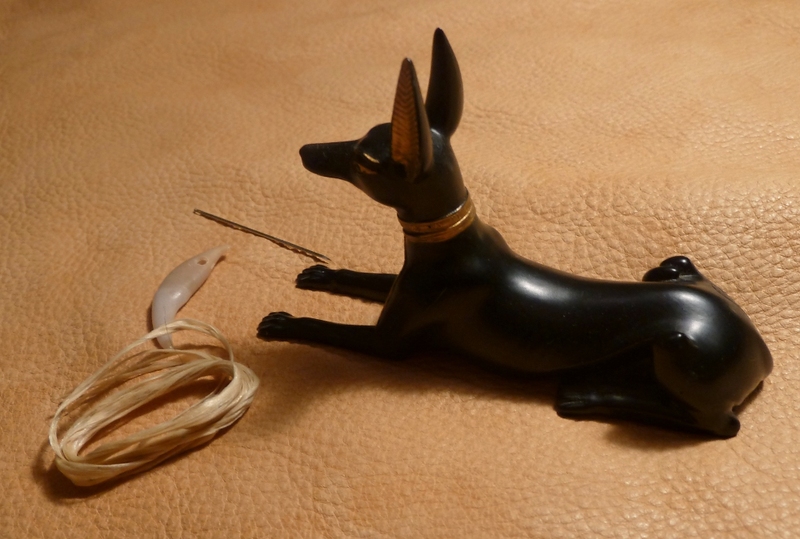 I inserted gold and black leather in her ears to mimic the striping often found in the ears of depictions of Anubis. The leather is one whole tanned lambskin hide, dyed black, and then with an overlay of gold on one side. 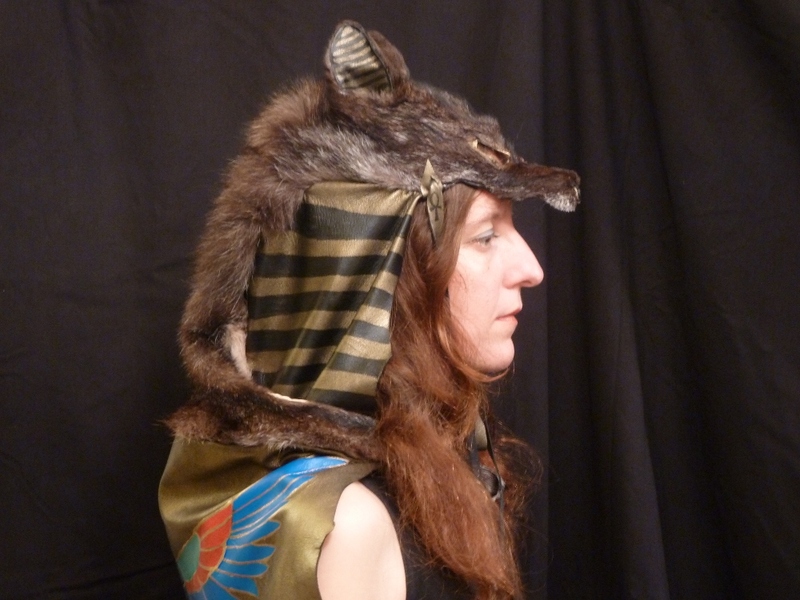 It forms the side panels of the hood, again striped, as homage to the Nemes headdress that Anubis and other deities were commonly depicted wearing; there are very few images of Anput Herself that remain, and as I was working on this inspired piece this is what She indicated She wanted. The mantle over the shoulders was the most difficult portion of this. I drew out the scarab and wings with a black fine tipped paint pen, and then colored it in with acrylic and oil paint pens in two shades of blue, green, and red, and detailed in gold. I tested all these on a scrap of the same leather to be sure of the colorfastness. The hieroglyphs descending from the mantle read “Input”, an alternate of Anput’s name, and below that is the standard of 17th nome (district) of Egypt, over which She reigned. The beaded accents on these leather pieces are a combination of new (reproduction) faience scarabs, and genuine old Egyptian faience beads (exact dynasty unknown). Each one of these dangles is about 1 1/8” long. 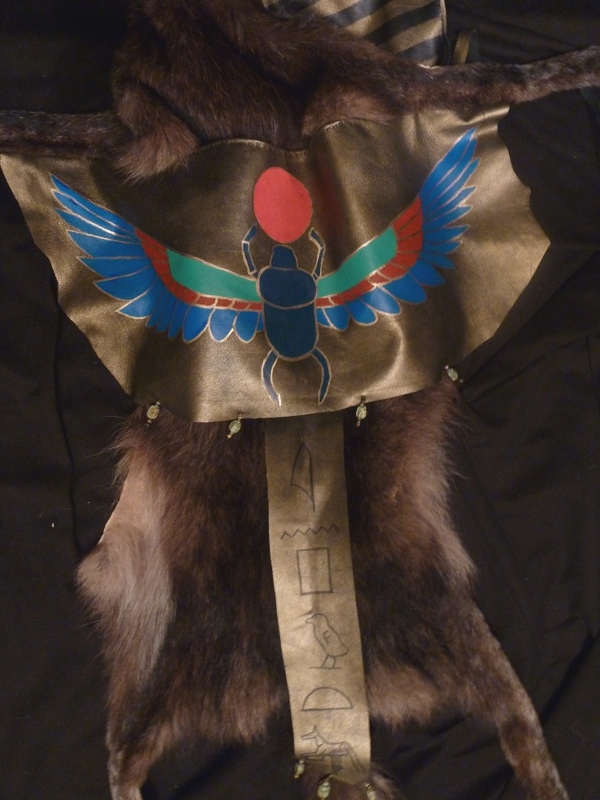 The headdress ties on with straps under the chin, and the forelegs also are tied together with more leather strappage. It is one size fits most; for scale, I am 5’4” and 115 pounds. This project did take me the better part of three days and nights with only small breaks. It is by far one of the most ambitious pieces I have done, and represents a shift to more elaborate and involved crafted artwork. In the weeks since I created this headdress, Anput has been a quiet but strong presence in my workspace, and she has actually brought Anpu Himself forward more as well, not that I should be surprised. The feeling I get is that they are aspects of each other, rather than spouses, though perhaps the distinction isn’t so strict. Sometimes I work with them both, sometimes Her alone. And as I work with the Divine in my art, I am beginning to feel the inklings of others who wish to have creations in their honor. I have long done this work with totems; every piece I create has been a tribute to the species’ totem as well as the individual animal spirit, whether a full dance costume, or a simple leather pouch. But there are other beings stepping forward now, adding yet another layer to what I am creating. And I’m very much looking forward to seeing where this will take us all. Just as a side note, the Anput headdress is not meant to stay with me, nor are the rest of the creations I will be making. The Anput headdress may be found here on Etsy. If you are interested in giving this work a home, or in commissioning your own art, please feel free to contact me. This entry was posted in Growth and Growing Pains, Mythology, Rites of Passage, Skin Spirits, Totems, Unverified Personal Gnosis. Bookmark the permalink. I actually had intended to try to find time to write you a brand new article; however, if this works as is I’m happy to let you have it (I have PLENTY of other projects to keep me busy). Whatever you would prefer is fine with me–if you have more to say, I’d love for you to say it! However, if other things that are higher priority (and which may, for example, earn you money) are more appealing to pursue, that’s also fine. Your choice, dear friend! Beautiful work! Thank you for sharing the story behind this piece. Thank you, and you are most welcome! An amazing piece. Allowing one’s self to be guided by those who came before us, many of which still watch over us, the true gift. Thank you for sharing.